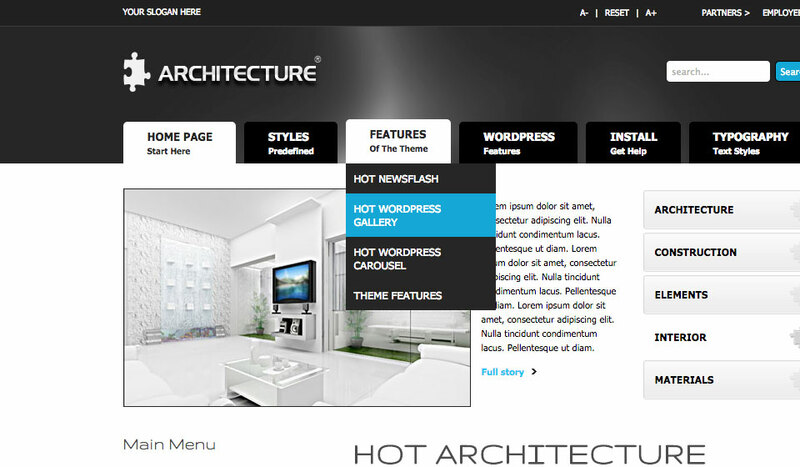 Architecture is a combination of the usability and the design, just like this theme. A house, a building, a living room… All these should look nice and pleasant. They also should make us feel comfortable. 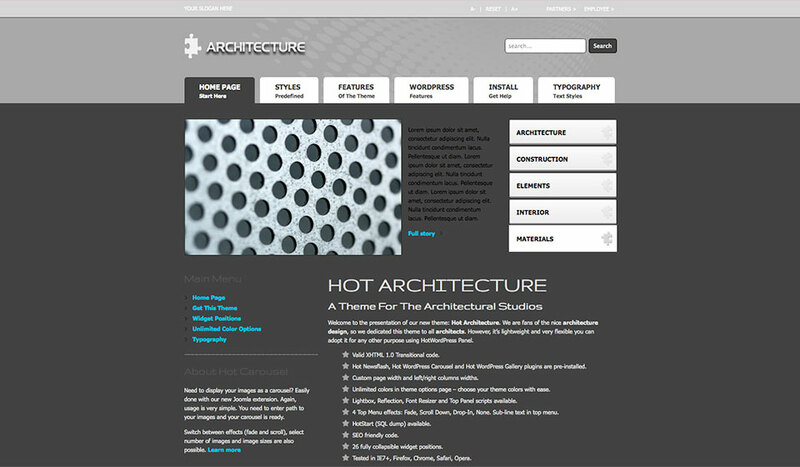 The Hot Architecture theme is also suitable for business websites for any other fields. However, we filled it with the sample data from the architecture and the construction business. 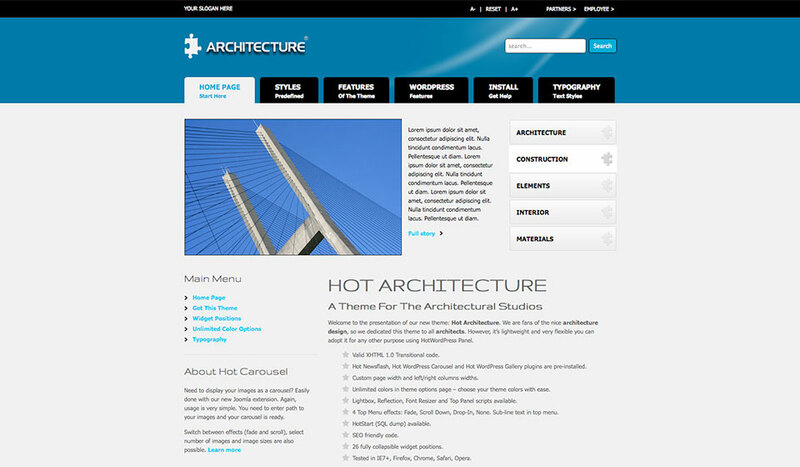 The front page of the Hot Architecture theme contains a big news rotator. This is our WordPress plugin – Hot Newsflash. It’s primarily developed for this theme. There, you can insert the main activities of your company or the most important parts of your portfolio. 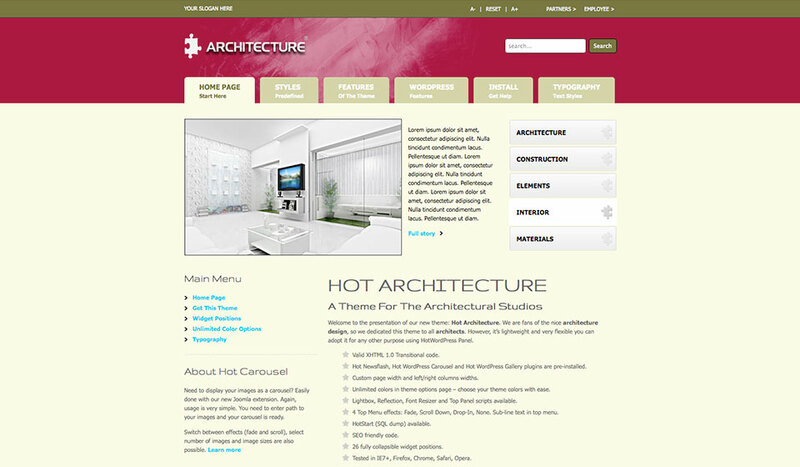 The theme design is clean and very usable. There are several more plugins included. 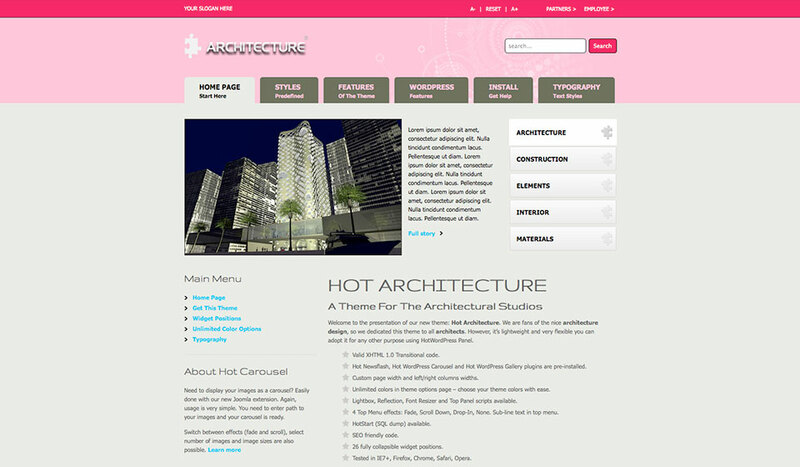 The Hot Carousel and The Hot Gallery plugins are both based on jQuery. 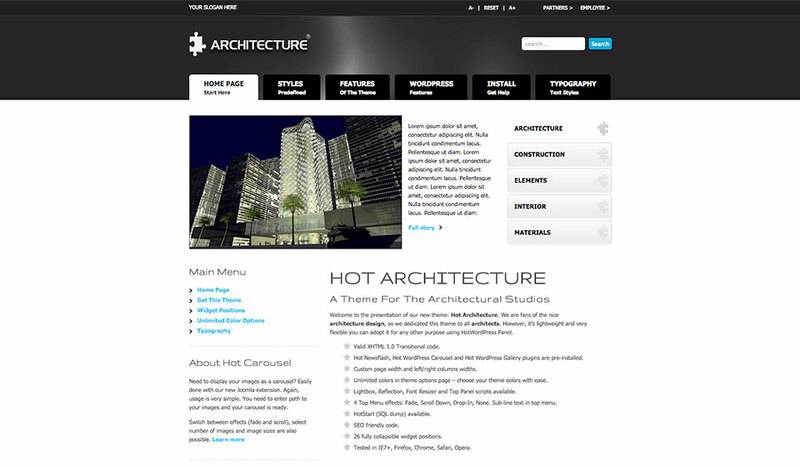 They will help you to present some of your works and make the pages of your site more attractive and contemporary. The top menu contains drop-down submenu items. The first level of the top menu items can contain one or two lines of differently styled text. 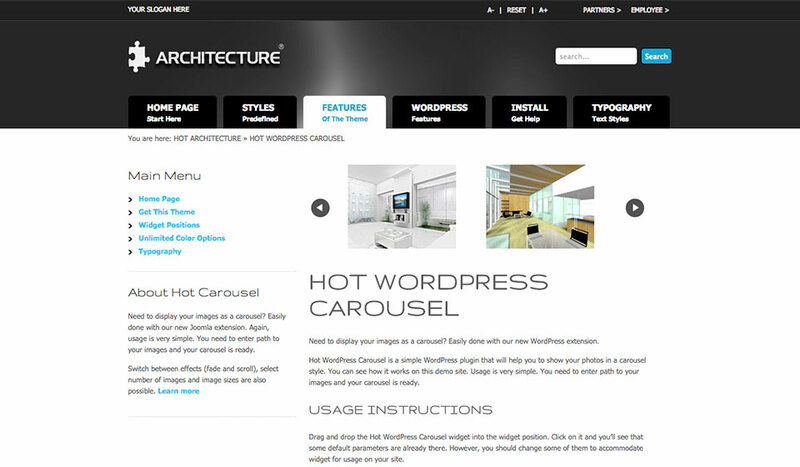 There are even more features is Architecture WordPress theme, such as lightbox, reflection effect and font resizer scripts. They are incorporate in the code of this theme. Architecture is based 100% on CSS. The width of the left and the right columns, as well as overall the theme width are parametrized. Therefore, this theme is fully flexible. 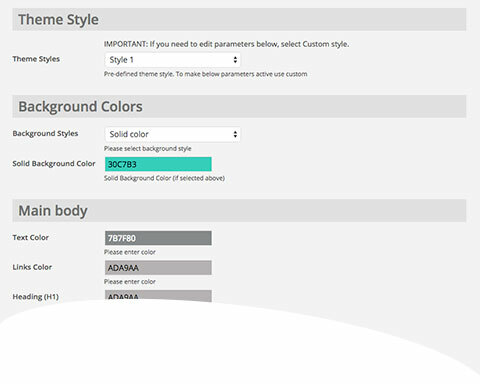 4 pre-defined color styles are available. Each color is easily customizable in parameters. You can make infinite color combination.